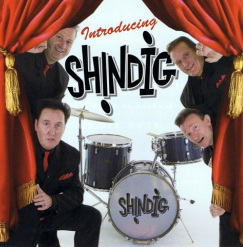 Shindig are pleased to anounce the release of their debut CD 'Introducing Shindig'. It features 14 tracks composed of vocals, three of which are instrumentals and five originals from the band members Shayne, Mark, Roger and Jeff. It is well presented and is met with great expectations from the likes of Ralph Gowling, Deputy Editor of The Beat Magazine & Chief Oganiser of Amersham Rock 'n' Roll Club 2012, in fact Ralph very kindly wrote the inner sleve notes for the album.